When people ask me what I am currently working on, I always have to think about my reply. The truth is, I am usually working on 2 or 3 mosaics at any one time. I always tend to have a large complex piece on the go (usually a commission), then another medium size mosaic that I may be making to go into one of the galleries. 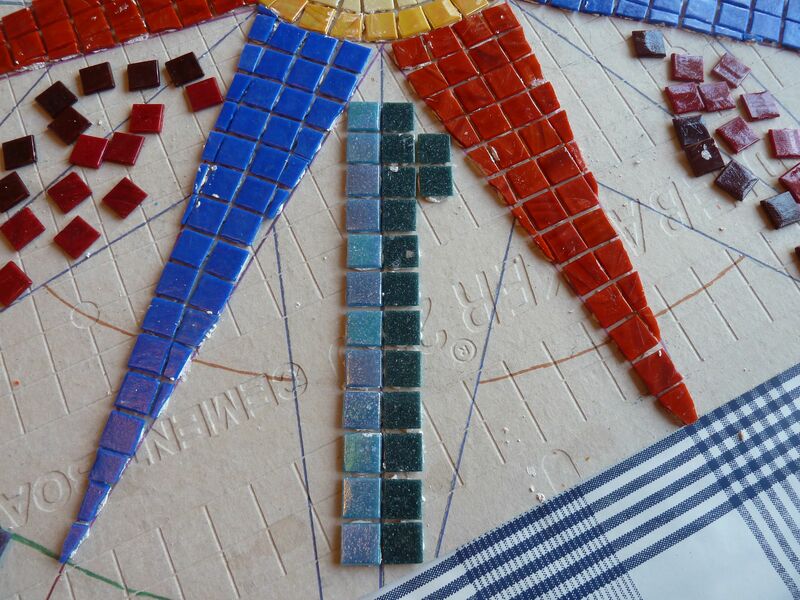 I often have a ‘fun’ piece also sitting on my work bench which is my ‘light relief’ mosaic. 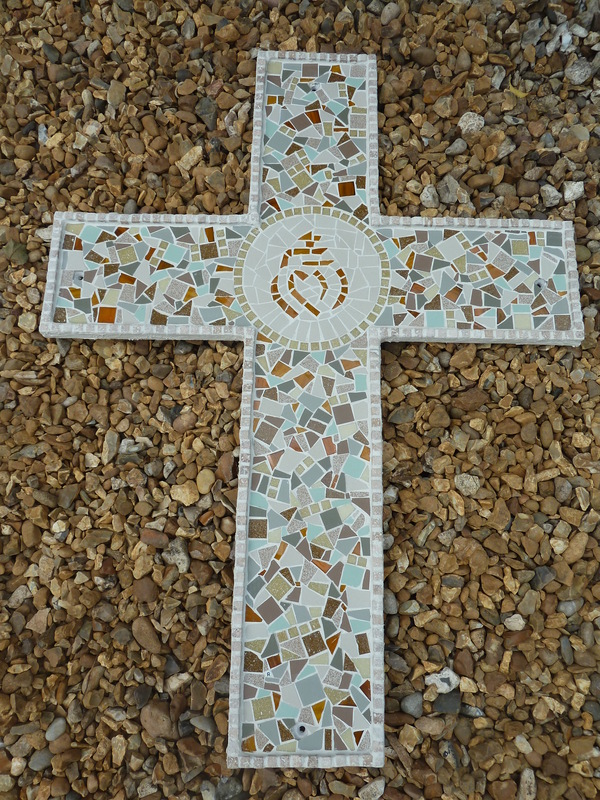 I love mosaicing so much that even if I haven’t got a reason to be making a piece, I will be playing mosaics anyway! 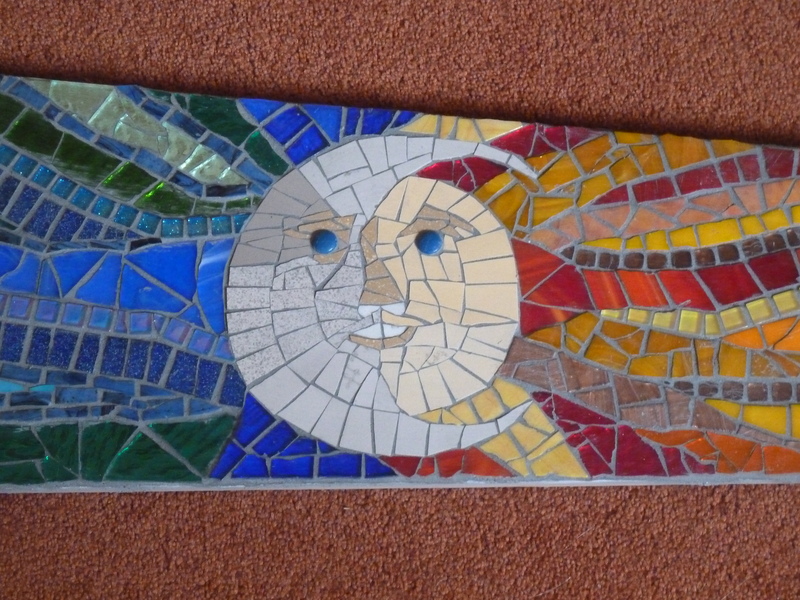 At the moment I am negotiating a commission with a client so am ‘between mosaics’ if you like, so this gives me time to play with my fun piece. It is a large slab of stone, 2 foot high traingular shape. I am calling it my ‘Totem Pole’ and it will sit in the middle of a flower bed in my back garden. 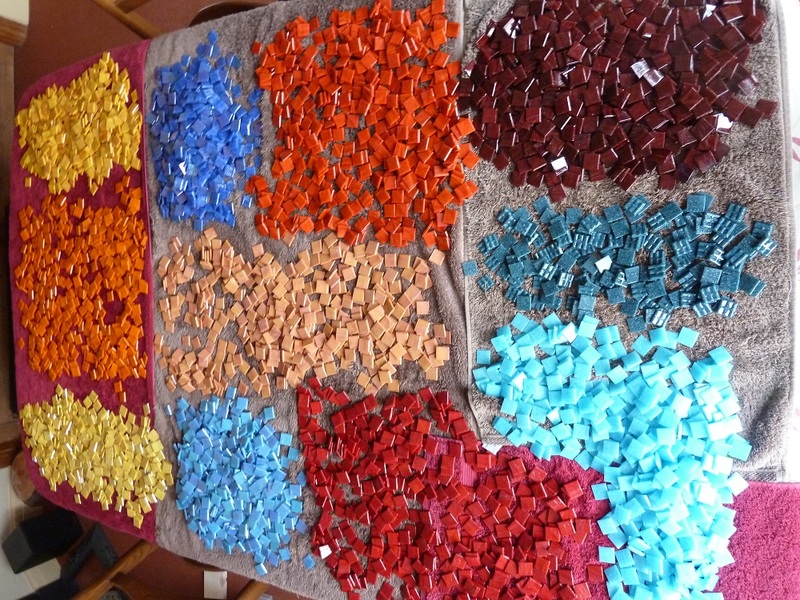 I want it to be very vibrant and eye catching, so I intend to use a lot of glass in it as well as the mosaic tesserae. I have started at the top with a ‘sun’ and rays flowing down. Not sure what the next section will be but I will keep you posted. I know it will take a long time but there is no rush and that’s what is nice about having a fun piece, I may just spend the odd half hour on it as and when. So it is quite quiet in mosaic terms for me but I have to admit it is nice to have a rest after all the excitement of the Marple Collection Exhibition. Once the commission is finalised it will be back to full steam ahead and will be snipping away. 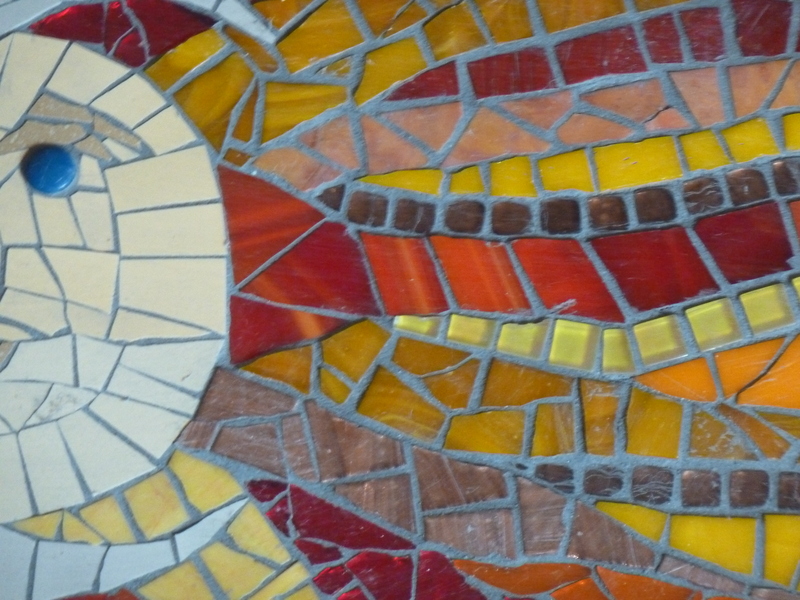 If you have any mosaic questions you would like to ask or any technique or aspect you are interested in knowing more about – please drop me a ‘Comment’ below or send me an email and I will answer in a Blog. I am delighted to report that the commission piece I have been working on for the last 5 months has finally been delivered, installed and is living happily with its new owners in Cheshire. It would be an understatement to say they like it – they ABSOLUTELY LOVE IT! 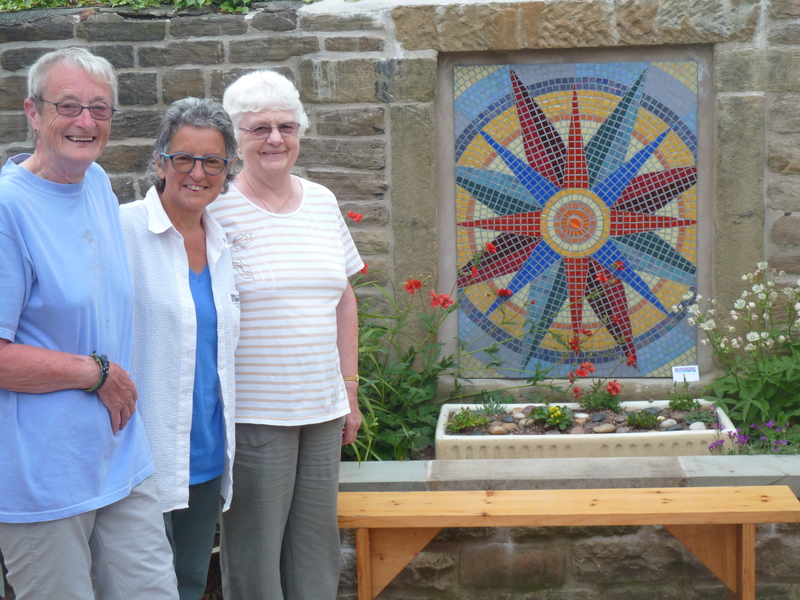 It all started back in February when I got an email from Hilary and Pauline asking if I would be interested in being commissioned to make a large outdoor mosaic to go into an inset in their walled, courtyard garden. We then talked on the phone and got on so well that I instantly agreed even though we were not sure what the piece was going to be. Over the next couple of weeks ideas and sketches were discussed and emailed and we very quickly agreed on a piece that we all liked. I could then go shopping for supplies! Hilary, Rosanna & Pauline with the mosaic in place. It was certainly an anniversary we will never forget and we have some lovely new friends in the processes. REQUEST: Let me know what you think of the mosaic, I love to hear your feedback. 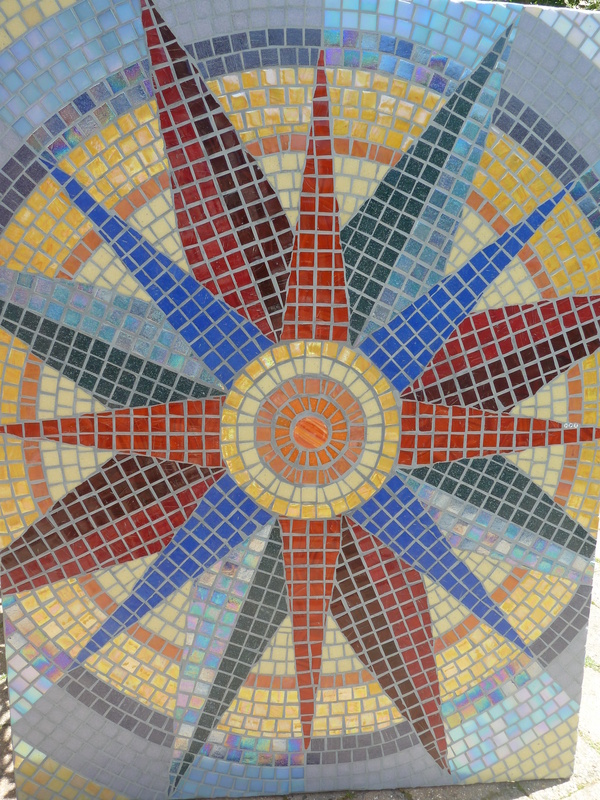 Now that spring has arrived, thoughts turn to outdoor mosaics. 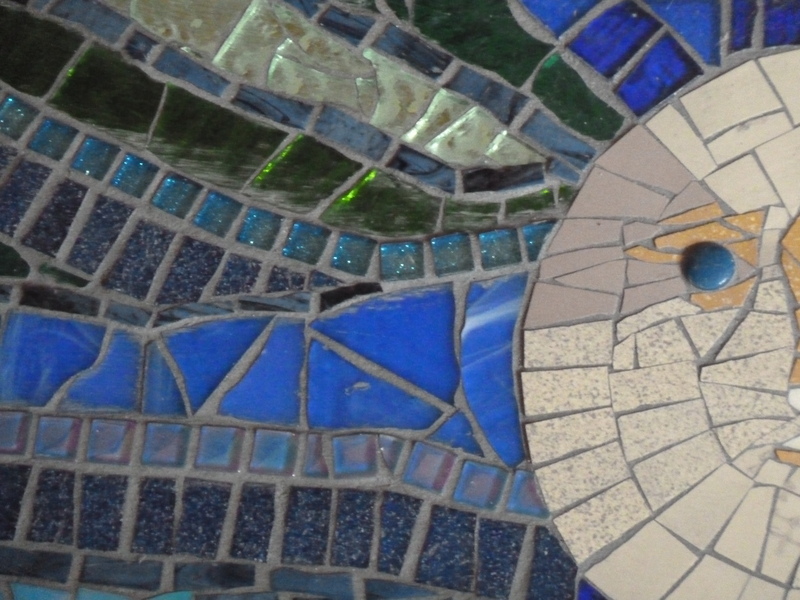 I spend so much time outdoors, either in my garden, cycling or walking, that it makes perfect sense that I should enjoy making outdoor mosaics. 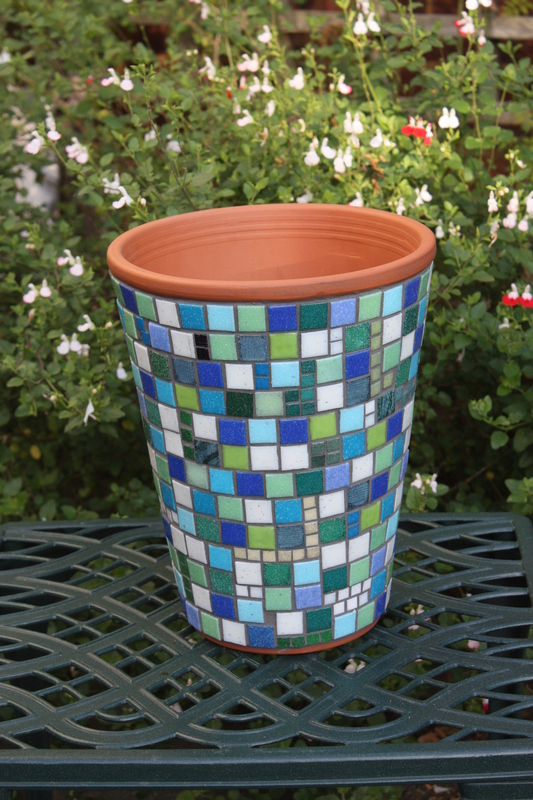 When I first started to mosaic I made a lot of outdoor terracotta pots. I then moved on to stepping stones and I have now cast my own. I then found a large supply of old roof tiles at the bottom of the garden and realised they were the perfect base to mosaic on. They are durable, weatherproof and it is always nice to re-cycle. They hang up very well which means they are perfect for door numbers and pictures. I also love making lizards and frogs on stones, these can be tucked into flower beds and rockeries and always make people smile. I would love to make a large lizard in situ on a huge boulder in a rockery – that could be my next project, after we have created the rockery! Here are some of the outdoor pieces I have made. I am happy to accept commissions for any outdoor piece – small or large. 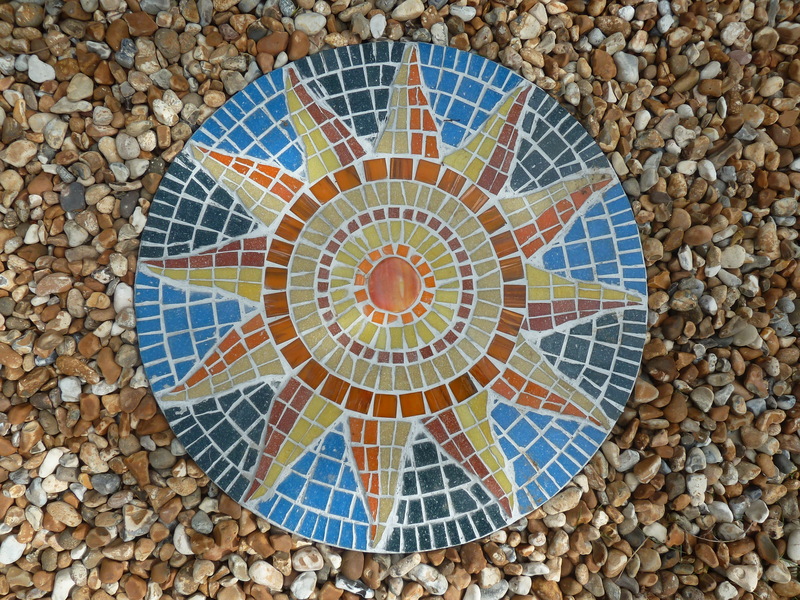 REQUEST: Why not consider a cheerful outdoor mosaic to brighten up your outside areas? Do call to discuss ideas.